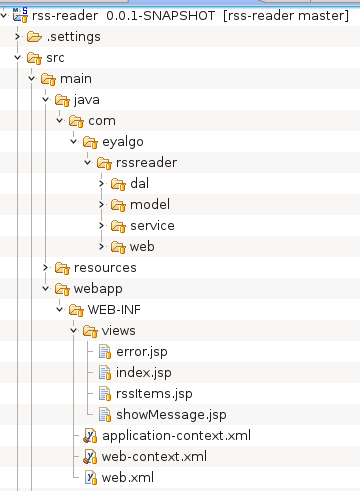 In this post I will show some guidlines to create a Spring web application, running it using Jetty and using an external library called ROME for RSS reading. I have recently created a sample web application that acts as an RSS reader. I wanted to examine ROME for RSS reading. I also wanted to create the application using Spring container and MVC for the simplest view. For rapid development, I used Jetty as the server, using a simple java class for it. All the code can be found at GitHub, eyalgo/rss-reader. At first, I could not get the correct Jetty version to use. There is one with group-id mortby, and another by eclipse. After some careful examination and trial and error, I took the eclipse’s library. I found ROME with newest version under GutHub. It’s still a SNAPSHOT. A few years ago I’ve been working using Wicket framework and got to know Jetty, and its easy usage for creating a server. I decided to go in that direction and to skip the standard web server running with WAR deployment. There are several ways to create the Jetty server. I decided to create the server, using a web application context. In web.xml I am declaring application-context.xml and web-context.xml . Besides scanning, I am adding the correct annotation in the correct classes. In order to have some basic view of the RSS feeds (and atoms), I used a simple MVC and JSP pages. To create a controller, I needed to add @Controller for the class. I added @RequestMapping("/rss") so all requests should be prefixed with rss. Each method has a @RequestMapping declaration. I decided that everything is GET. Just add @RequestParam("feedUrl") before the parameter of the method. After adding an RSS location, I wanted to redirect the answer to show all current RSS items. So the method for adding an RSS feed needed to return a String. The returned value is: “redirect:all”. In Spring MVC, when a method returns a String, the framework looks for a JSP page with that name. If there is none, then we’ll get an error. The name will tell Spring MVC which JSP to refer to. In this example, it will look for rssItems.jsp. In the JSP page, you need to refer the names of the objects you added. And then, you can access their properties. Spring “knows” to add jsp as a suffix to the ModelAndView name because I declared it in web-context.xml. In the bean of class: org.springframework.web.servlet.view.InternalResourceViewResolver. By setting the prefix this bean also tells Spring were to look for the jsp pages. There are several ways to handle errors in Spring MVC. I chose a generic way, in which for any error, a general error page will be shown. First, add @ControllerAdvice to the class you want to handle errors. Second, create a method per type of exception you want to catch. You need to annotate the method with @ExceptionHandler. The parameter tells which exception this method will handle. You can have a method for IllegalArgumentException and another for different exception and so on. The return value can be anything and it will act as normal controller. That means, having a jsp (for example) with the name of the object the method returns. In this example, the method catches all exception and activates error.jsp, adding the message to the page. ROME is an easy to use library for handling RSS feeds. rome-fetcher is an additional library that helps getting (fetching) RSS feeds from external sources, such as HTTP, or URL. To make life easier, I used rome-fetcher. It gives you the ability to give a URL (RSS feed) and have all the SyndFeed out of it. If you want, you can add caching, so it won’t download cached items (items that were already downloaded). All you need is to create the fetcher with FeedFetcherCache parameter in the constructor. If you get a warning message (looks as System.out) that tells that fetcher.properties is missing, just add an empty file under resources (or in the root of the classpath). This post covered several topics. You can also have a look at the way a lot of the code is tested. If you have any remarks, please drop a note.